PH0000135/94 - PLYMOUTH CITYBUS LTD, MILEHOUSE, MILEHOUSE ROAD, PLYMOUTH, PL3 4AA Variation Accepted: Operating between St Budeaux, Square and Eldburton/ Staddiscombe given service number 5/5A effective from 04-Sep-2016. To amend Timetable. PH0000135/169 - PLYMOUTH CITYBUS LTD, MILEHOUSE, MILEHOUSE ROAD, PLYMOUTH, PL3 4AA Cancellation Accepted: Operating between PLYMOUTH, ROYAL PARADE and PLYMOUTH, ROYAL PARADE given service number 10 effective from 04-Sep-2016. One of the main suprises! PH0000135/171 - PLYMOUTH CITYBUS LTD, MILEHOUSE, MILEHOUSE ROAD, PLYMOUTH, PL3 4AA Variation Accepted: Operating between Liskeard, Post Office and Padstow, Station Road given service number 11A effective from 04-Sep-2016. To amend Route and Timetable. PH0000135/162 - PLYMOUTH CITYBUS LTD, MILEHOUSE, MILEHOUSE ROAD, PLYMOUTH, PL3 4AA Variation Accepted: Operating between Plymouth, Royal Parade and Launceston, Westgate Street given service number 12 effective from 04-Sep-2016. To amend Timetable. PH0000135/161 - PLYMOUTH CITYBUS LTD, MILEHOUSE, MILEHOUSE ROAD, PLYMOUTH, PL3 4AA Variation Accepted: Operating between Launceston, Westgate Street and Bude, The Strand given service number 12B effective from 04-Sep-2016. To amend Route and Timetable. Renumbering from the 12? PH0000135/1 - PLYMOUTH CITYBUS LTD, MILEHOUSE, MILEHOUSE ROAD, PLYMOUTH, PL3 4AA Variation Accepted: Operating between PLYMOUTH Royal Parade and KINGS TAMERTON Steph.Way given service number 16 effective from 04-Sep-2016. To amend Route and Timetable. PH0000135/100 - PLYMOUTH CITYBUS LTD, MILEHOUSE, MILEHOUSE ROAD, PLYMOUTH, PL3 4AA Variation Accepted: Operating between St Budeaux, Square and St Budeaux, Square given service number 21/21A effective from 04-Sep-2016. To amend Timetable. PH0000135/176 - PLYMOUTH CITYBUS LTD, MILEHOUSE, MILEHOUSE ROAD, PLYMOUTH, PL3 4AA Variation Accepted: Operating between Plymouth, Royal Parade and Torpoint Ferry, Pottery Road given service number 32 effective from 04-Sep-2016. To amend Route and Timetable. PH0000135/53 - PLYMOUTH CITYBUS LTD, MILEHOUSE, MILEHOUSE ROAD, PLYMOUTH, PL3 4AA Variation Accepted: Operating between PLYMOUTH Royal Parade and ESTOVER given service number 34/34A/34B effective from 04-Sep-2016. To amend Timetable. PH0000135/42 - PLYMOUTH CITYBUS LTD, MILEHOUSE, MILEHOUSE ROAD, PLYMOUTH, PL3 4AA Variation Accepted: Operating between PLYMOUTH Royal Parade and HAM Merrivale Road given service number 35/35A effective from 04-Sep-2016. To amend Timetable. PH0000135/7 - PLYMOUTH CITYBUS LTD, MILEHOUSE, MILEHOUSE ROAD, PLYMOUTH, PL3 4AA Variation Accepted: Operating between PLYMOUTH Royal Parade and SOUTHWAY given service number 40/41 effective from 04-Sep-2016. To amend Timetable. PH0000135/13 - PLYMOUTH CITYBUS LTD, MILEHOUSE, MILEHOUSE ROAD, PLYMOUTH, PL3 4AA Variation Accepted: Operating between Derriford Hospital and Ernsettle given service number 43 effective from 04-Sep-2016. To amend Route and Timetable. This is the current service 50 Yellow Flash. It is being split again regaining number 43 for the City - Ernesettle section. It remains to be seen which section gets the Yellow Flash fleet. PH0000135/10 - PLYMOUTH CITYBUS LTD, MILEHOUSE, MILEHOUSE ROAD, PLYMOUTH, PL3 4AA Variation Accepted: Operating between PLYMOUTH, ROYAL PARADE and WHITLEIGH given service number 44 effective from 04-Sep-2016. To amend Route and Timetable. PH0000135/154 - PLYMOUTH CITYBUS LTD, MILEHOUSE, MILEHOUSE ROAD, PLYMOUTH, PL3 4AA Variation Accepted: Operating between PLYMOUTH ROYAL PARADE and TAVISTOCK BUS STATION given service number 45/46A/46B effective from 04-Sep-2016. To amend Timetable. Not sure what the 45 is! PH0000135/76 - PLYMOUTH CITYBUS LTD, MILEHOUSE, MILEHOUSE ROAD, PLYMOUTH, PL3 4AA Variation Accepted: Operating between Derriford Hospital and Derriford Hospital given service number 50/50A effective from 04-Sep-2016. To amend Route and Timetable. This is the old 51 (and 29 before that) which joins up with the City - Derriford section of the 50 to run as a full circle service. Itremains to be seen where the Yellow Flash buses end up. PH0000135/150 - PLYMOUTH CITYBUS LTD, MILEHOUSE, MILEHOUSE ROAD, PLYMOUTH, PL3 4AA Variation Accepted: Operating between Plymouth Royal Parad and Cremyll, Edcumbe Arms given service number 70/70A/70B effective from 04-Sep-2016. To amend Route and Timetable. PH0000135/159 - PLYMOUTH CITYBUS LTD, MILEHOUSE, MILEHOUSE ROAD, PLYMOUTH, PL3 4AA Variation Accepted: Operating between Plymouth, Royal Parade and Liskeard Railway Station given service number 71 effective from 04-Sep-2016. To amend Route and Timetable. PH0000135/164 - PLYMOUTH CITYBUS LTD, MILEHOUSE, MILEHOUSE ROAD, PLYMOUTH, PL3 4AA Variation Accepted: Operating between Plymouth, Royal Parade and Polperro, Crumplehorn given service number 72 effective from 04-Sep-2016. To amend Route and Timetable. PH0000135/165 - PLYMOUTH CITYBUS LTD, MILEHOUSE, MILEHOUSE ROAD, PLYMOUTH, PL3 4AA Variation Accepted: Operating between Liskeard, Lloyds Bank and Callington, New Road given service number 74 effective from 04-Sep-2016. To amend Timetable. 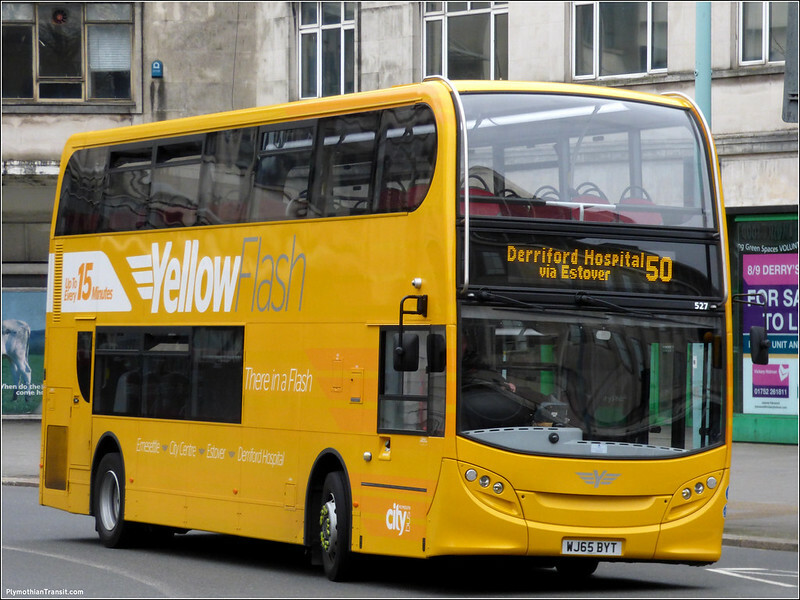 With the Yellow Flash 50 being split from the 43 and merged with the current 51 the Yellow Flash fleet will have to be relettered up for whichever service they end up on. The new 50 50A will be ideal for me as it saves me having to change buses at Derriford on the way to work in the morning. If we get to keep the nice yellow buses then I will be even happier! Service 46 between Plymouth and Tavistock is renumbered to 45, with buses continuing beyond Tavistock to Okehampton, remaining as service 46. The timetable is otherwise unchanged. Apparently advice given by DVSA to distinguish different sections of route that have guaranteed connections. im a bit confused with the service 50/50a is it doing what it used to a long time ago where it changed into a 61/62 at dirrford to go transitway and st budeaux but as just one route being 50 and then a 43 will come back as a separate service so it dont change from the 50 in town? full details are yet to be revealed but the two routes are being separated so the 43 wont turn into a 50. the new 50/A is a circular taking over the 51 from city to Derriford then the old 50 from Derriford to the City. 50/50A is going to be Orange Flash doing a circular using new GAS buses. Pulling out of saltash? I think you're forgetting or must not be aware they started a new service in saltash just over a week ago!? Green flash 5 which appears to be getting good use. I hear we are getting gas powered single deckers for the 43 and they will become Orange Flash. Someone is forgetting that the 20A still goes to ivybridge so not pulled out from that area. Not nuch of a service though is it... once an hour if you are lucky via Lee Mill and Plympton, as opposed to Gold and X38 every 20/30 mins direct. 20a is subsidised as well I believe, so effectively PCB pulled out when they hastily withdrew the 45 when Stagecoach took over from First, just like the 46 hardly constitutes a service to Tavistock when they quickly withdrew Blue Flash from Tavistock last September. The fact these routes along with 4a from Mountbatten so fast can only mean they were not doing that well and did not fancy their chances against Stagecoach. The fact that come September they will only have a very sparce 11/12 service to/from Saltash without going miles out of your way via Devonport means Saltash will soon be off the Citybus map soon I feel. I think Stagecoach could do quite well if they ever expand by providing services to other area without changing timetables every 3 months! Sparce service? The 11/12 services in saltash provide a bus every 15 mins during the day!? Citybus were winning in Saltash just prior to Stagecoach commencing operations, but constant fare changes and route alterations meant they became an unattractive company to travel with. Shame. And that's why first went bust and stagecoach have a restricted stagecarridge operation. The city is not big enough for two major operators. Also both companies have one of the lowest fares in the country due to the bus war over the last few years. Re the 20A to Ivybridge, Citybus have been very successful with this service. The old First operated Service that the 20A replaced was 2 hourly and often completely empty. The 20A is hourly and carries quite a few passengers, particularly since it started going in to Lee Mill Tesco. Well, the application no. ...135/94 states: "Operating between St Budeaux, Square and El[d]burton/ Staddiscombe" implying the Saltash extension is abandoned, which if true means that decision must have been taken before it even started. you cant take that from the application as the start and end points are often wrong. The 43 is shown as serving Derriford - it wont be, its just a hang over from the old route details. Also the application is for a timetable change only. If they were withdrawing from Saltash it would have to a route change. The proposed PCB timetable changes in September are now on Traveline. Only checked a few so far and it appears to be cuts to frequencies. 40/41 cut to 4 an hour from 6 present. 11/12 now just once per hour each leaving town at almost same time. Is this a gap for Stagecoach to sneek in ? Whomever said that Citybus were on the way out of Saltash could have a point, yes the Green Flash goes there but it is an extra 10 mins on the journey to Citycentre via Devonport and costs more than Stagecoach. A check on Traveline shows massive reduction in the 11/11a/12 as well down to 1 per hour on each route, nowhere near every 15 mins now..not to mention the 10 withdrawal as well meaning other than the main road through Saltash, Citybus are virtually non existent. Game set and match to Stagecoach here I think. Not anymore. Major cuts to 11/12, plus 10 axed. Green flash only real Citybus service but via Devonport. Citybus seem to have killed themselves off in Saltash. Will they be bothered with 11/12 at all soon, or is Stagecoach for Callington etc ? Very strange but the 44 does not even exist on Travelline from September. If I put in Plymouth to Whitleigh, it gives no service other than walk from Crownhill or Ernesettle? It sometimes takes a while for Traveline to get updated timetables up on line. clear case of having to wait for the full info to emerge. This is not a cut. The 45 is the Plymouth to Tavistock section of the old 46. It continues almost exactly the same over this section, just with a different route number which I am lead to believe was requested from above (VOSA or Traffic commissioners?) The section from Tavistock onwards continues as the 46, whose new timetables are not yet on traveline. If there are any cutbacks to that section it will be at the request of Devon CC who pay for it. I cant see how the new 50 50A loop uses any additional resources to what gets used now. its simply a different combination of routes joined together. Without a full analysis it looks to me like it will continue to use the same yellow flash fleet as before. Apart from the Plymouth to Tavistock section being renumbered to 45, the timetable is the same as that introduced back at the end of March. I didn't even read the title of the post but saw the amount of comments so knew it would be about Citybus, I suppose now first have gone and stagecoach offer a skeletal service there's no one left to hate!? I'd say saltash have a good service from both company's but imo Citybus have the advantage because they are coming through anyway they don't nessacarily have to rely on picking passengers up in saltash, stagecoach are busy and full during commuter times but gave a look during the day and you will see only a couple of passengers sometimes none at all. Stagecoach certainly aren't doing great anyway 6 months ago they had a surplus of 30+ drivers now they're short staffed and desperately recruiting, the staff there are saying come back first all is forgiven! There's also talk of job loss/relocation at Dartmouth due to stagecoach closing the depot there. Usual bunch of Citybus knockers as soon as any service changes are announced. Maybe the company is responding to customer demand - or lack of it. Be careful what you wish for - some locations have ended up with no bus at all, never mind a less frequent one. Some view competition as universally beneficial to the bus user and bus company employees. Not necessarily. In these days of reduced or non existent subsidies, if a route will not support more than one operator, it could be argued that one company should be allowed the monopoly. There will be only one winner otherwise - the car. Without any bus the consumer without access to a car is marooned. Stagecoach indicated, when they first came to Plymouth, that it was their intention to try and attract new people onto buses generally and by implication not existing passengers from other companies. In my humble opinion, that should be the way forward. Talking of Dartmouth and the 3 service, the last few weeks several services from Dartmouth to Plymouth and the return working, have failed to run due to lack of staff at Dartmouth. Two return services on one day alone. The 90 and park & ride service is combined at times also due to staffing problems. No spare bus at Dartmouth does not help if there is a mechanical problem. Stagecoach say its due to breakdowns, but as a driver the truth is obvious. Staff are fed up with the conditions and the lack of anyone who seems to know what they are doing. Another driver is leaving for Tally Ho, they pay more then Stagecoach, and staff are much happier. Cant believe how much happier staff were under First, never thought i would say that. Services 81-85 are going to be staff buses but are also available for public to use. Idea is that at the moment present Trooper/Staff buses are illegal as not tachographed or set route. By adding set routes, staff will now have to use these to get to and from work. Rumour is they will be gone by Christmas as they won't be profitable. Please explain further - Where do you get your information from to say Trooper/Staff buses are illegal and need to be tachographed and to a set route? Why on earth would they need to be tachographed?? Staff buses don't need to be profitable, they are a business overhead just like printing timetable leaflets or paper clips for the office desk. Not sure about being illegal - and tachos wont be needed. Staff buses are a business overhead however, the regulations and grey areas in PCV regulations were tightened up a few months back. Vehicles running on an ad-hoc basis such as the PCB staff troopers are classified as hire and reward and therefore need to run under EU regs with restrictions on drivers hours and the use of tachographs. Citybus do not have an EU roster as FDC used to, as all routes are registered to avoid the need for the additional costs of EU working. Therefore to make the staff buses legal they will operate to fixed routes and times. This will make them accessible to anyone. It is my understanding that the routes will give additional access to Derriford and the City Centre at times far earlier than is currently possible, albeit from limited routes. This is nothing new Stagecoach in Exeter for years ran their early morning staff buses to fixed routes and times. Some journeys, I'm told were quite busy with regular passengers. I think Stagecoach do not operate staff buses in Plymouth a legacy from FDC days, although I am happy to be corrected on this. Services 40/41 going to be Purple flash. Do you lot want a bus every 5 minutes or something. You clearly don't realise it's not cost effective to run a bus from one side of the city to other for just a few people. If these routes were more popular like say the 44 or the 40/41 then they would put more on. City bus is not hanging itself the law states there must be choice given to a customer so a city can't be run by one company. You want more buses on then you will have to pay higher fares, that the way it works for any company in plymouth. What are you talking about? There is no 'law' that says places have to have more than one bus company. Never has been. It would be totally unworkable. Who are the other bus companies giving a choice to residents of Exeter or Torquay, exactly? Stagecoach yes, and who else.....? What about Truro? Or Taunton? Shall I continue? I like how the administration is only posting what it wants. Makes the conversation bad. Bus bashers. The administration (me) has posted most comments, there are a few to this thread which have not made it through as they are just rants against Citybus with nothing new to say other than that Citybus are dead in Saltash now and that Stagecoach are going to walk all over them. Comments which have been made on this blog ever since SC came in to Plymouth. Posts which at least make a point in a way that most readers can understand have made it though. There are plenty of comments getting posted which I disagree with. If they add something to the debate then they go through, its as simple as that. Is the 40/41 going to use the 12 gas powered buses that are arriving at Citybis soon. I assume these are the MAN Ecocity buses with Caetano bodies from Anglian Bus. These have 62 and 13 plates. There were originally 13 of them but one was lost in an accident. I also believe that when these arrive another 10 of the earlier Darts will be withdrawn. Graham, thank you for saving us from reading more of the biased nonsense that gets posted as comments. I still despair though at the rumours presented as fact by many posters: orange flash, purple flash, this route, that route. For those of us outside of the area it's incredibly frustrating. It would be fine if the comments were stated to be rumours but they rarely are. I totally agree with the way Graham administers his blog and certain comments should not get through especially if they are out and out rants against people or bus companies. I was under the impression that this blog was a way of enthusiasts passing on information to other enthusiasts so that we all get the latest info and photographs as soon as it is available. Graham is a working man and keeps the blog as informative and as up to date as he can and gives up a lot of his precious spare time in doing so. Thank you for that Graham. If your comments are constructive and informative they will undoubtedly get through. So please, fellow enthusiasts, lets keep it that way so we can all continue to enjoy this blog.